As I was reminded recently, some folks can’t tell the difference between thoughtful disputation and just plain, ornery, contradiction. When I take a position contradictory to the established order, I always try to work from a reasoned basis. I also try to find the humor in what is sometimes a tense process. Man: An argument is a connected series of statements intended to establish a proposition. Other Man: No it isn’t! Man: Yes it is! ’tisn’t just contradiction. Other Man: Look, if I “argue” with you, I must take up a contrary position! Man: Yes but it isn’t just saying ‘no it isn’t’. Other Man: Yes it is! Man: No it ISN’T! Argument is an intellectual process. Contradiction is just the automatic gainsaying of anything the other person says. Funny stuff, easily applicable to real world issues. For instance, I’m looking for more reasoned debate on Carolina North and a little less reflexive contradiction. Council member Laurin Easthom says “Now is the time” for the community to get involved with the planning for Carolina North. Now is the time. Now is the time to comment on Carolina North, the largest development to ever hit the Town of Chapel Hill. The Town Council and UNC Trustees are meeting monthly to hash out a development agreement that will allow UNC flexibility and assurances in its development of Carolina North. If we come to an agreement by June on how Carolina North will develop, we may be done for years in decision making on how things are done. It’s time to wake up, and get active, and come to these meetings so that UNC can hear what you think. Damn straight, especially if you serve on one of our Town’s advisory boards. The Carolina North train has left the station and is picking up speed, “Now” is definitely the time. Trash Talk: Shall We Stand United? Rogers-Eubanks Community Says “Yes”! I knew that the final siting of the solid waste transfer station might devolve into an “us vs. them” debacle – pitting neighbor against neighbor. Orange County is no stranger to inter-community bickering caused by waste-related issues. From the beginning, as I made contact with leaders of various organized groups – the Rogers Road community, Hillsborough’s Orange County Community Awareness, Highway 54’s Orange County Voice – I asked that they look at those concerns they have in common and work together as a united front. Fortunately, the folks involved across the county, coming from different perspectives, have found common ground and, essentially, joined together to confront the challenge of managing our solid waste responsibly. Good evening Chairman Jacobs and Other Members of the Board. My name is Neloa Jones. I am a resident of the Rogers-Eubanks Community, co-chair of the Coalition to End Environmental Racism (CEER), and a member of the Roger-Eubanks Neighborhood Association (RENA). For 36 years, the Rogers-Eubanks Community has hosted two municipal solid waste landfills, two construction and demolition landfills, a hazardous waste collection site, a recyclables sorting and packaging facility, a mulch/compost site, and a 1/3 acre leachate pond that even the county believed threatened our groundwater. For these reasons, my community certainly empathizes with ANY community that might also become a host community for solid waste, and I am here tonight to ask that the county GUARANTEE certain provisions and compensation to the community asked to host the waste transfer station. Unfortunately, for its 36 years of service to the county, the Rogers-Eubanks Community has never received ANY compensation. We consider this treatment to be unjust and immoral; we do not want another community to receive similar treatment. For many Rogers-Eubanks residents, our community represents the legacy of ex-slave ancestors who attempted to prosper as they established a community. It represents the legacy of ancestors who wanted to preserve the land to live on and pass to their children and their children’s children. Our ancestors never envisioned a community blighted by pollution, deflated property values, and the loss of business opportunities. They never envisioned a community blighted by buzzards and vermin, the stench of garbage, and contaminated water. NO, as a member of the Rogers family–FIFTH-generation–I believe that this IS NOT what my ancestors envisioned. As CEER and RENA members, no, we cannot stand by and watch another community destroyed and its quality of life sacrificed. We hope the people of Orange County and our local governments will use the lessons of the past and probe their consciences so that they do what is right for Orange County. Finally, we should ensure that as we look to waste-to-energy and other waste disposal alternatives, we do not bring more technology and waste facilities to Eubanks Road. The Chapel Hill Historical Society will present The History of Print Media in Chapel Hill and Carrboro on Sunday from 3 to 5 p.m. The featured speakers will be Don Evans, an editor and writer at The Chapel Hill News for three decades, and Kirk Ross, former managing editor of the Independent Weekly and co-founder of The Carrboro Citizen. “Our event will look at the history of newspapers and print media in our towns and will surely spark a discussion about the future of newspapers here,” said Chapel Hill Historical Society Chairman Terry Barnett. The program is free and open to the public and will be held in the lower level of the Chapel Hill Museum, 523 East Franklin St. Parking is available in the museum lot [MAP]. Chapel Hill has been blessed over the years with a variety of media outlets. Their evolutions and declines, reformations and restorations a harbinger of what comes next in journalism in the on-line age. Don’s (and formerly Kirk’s) Chapel Hill News has a ‘net presence via OrangeChat. Kirk is a pioneer – creating a newspaper, the Carrboro Citizen, on-line first then moving its content to the quaint dead tree distribution network. Unfortunately I have a previous engagement on Sunday. This should be an interesting presentation where, I’m fairly sure, some curious back-stories of Chapel Hill will emerge. Carolina North: Community needs to wake up and show up! The Daily Tar Heel’s Emily Stephenson chimes in here (DTH ‘blogs). A story on yesterday’s poor turnout here. Earlier today (Nov. 19th), UNC’s Board of Trustees approved the draft Carolina North design guidelines making the proposal official UNC policy. This evening, the first in a series of informational/public feedback sessions on Carolina North was held. With the creation of the Carolina North development agreement well on its way, the Council’s explicit call to advisory boards to attend, if possible, and the aggressive schedule to meet next July’s commitment, I expected a fairly full house. Crowded house? Not the case. The meeting started with roughly two dozen citizens in attendance. By the time Jack wrapped his presentation covering UNC’s design intent the group of interested citizenry was down to 19. At the end of the Dr. Owen’s presentation, covering the development agreement process, only 17 non-staff/non-press folks remained. Of those, eleven were drawn from the “usual suspects” ( Fred Black, Joyce Brown, Fred Stang, David Godschalk, George Cianciolo, Lynne Kane, Mike Collins, Loren Hintz, Ed Harrison, Bob Henshaw, me). Disappointing! As Carolina North’s development director Jack Evans noted this evening, the formal process for approval has begun. The first phase of Carolina North is on its way. Chapel Hill residents need to wake up and show up. 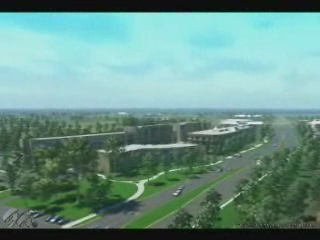 Every resident will eventually be affected by Carolina North’s development. At least 5 advisory boards will be consulted on both the outline and details of the development agreement. Community groups like the Friends of Bolin Creek and Neighborhoods for Responsible Growth (well represented this evening) could play key roles in shaping the discussion. There is quite a bit of work before the community. If we follow Pal Alto’s trajectory, the development agreement – which is, as Dr. Owens pointed out again this evening, essentially a binding legal contract – could swell to 200+ pages over the next 8 months (that’s 25 or more pages of detailed legal requirements per month – a heavy responsibility). Those pages will dictate development over a long period. Once set, unlike zoning ordinances, the ability to tweak conditions requires mutual agreement. Mistakes could be difficult to correct. The community has a tremendous opportunity to shape the outcome at Carolina North. Both UNC and Chapel Hill’s Town Council agreed to involve the public at every point in the process. But, so far, Chapel Hill’s citizens have not turned out. The negotiations between UNC and the Town will continue to accelerate. The momentum is building rapidly. My concern is that by the time citizens go into reactive-mode – recognizing missing elements in the plan, trying to wedge in protections beyond those outlined – the inertia will be too great and the time too short to significantly change course. Now is the time for public concern. Now is the time for community involvement. Because of the extensive impacts Carolina North will have on this community over the next several decades, I’ve asked Council to “bang the drum loudly”, to go beyond simply inviting the public into the process. We need to seek out folks, develop multiple avenues of engagement and draw them into the discussion. That said, at some point it comes down to whether our citizens want to shoulder their part of the burden and work on behalf of folks that will live here decades hence. My previous posts tracking requests for information, feedback and general commentary to our Town staff and elected folks seem to be fairly popular. I’m going to continue to post correspondence which might be of public interest. The Town’s Technology Board (now defunct) was the first advisory board I regularly interacted with. The first meeting I attended was about six years ago (I was a lowly citizen then, not a member). I presented the group what I called a “technology manifesto” of proposed technology enhancements for the Town. The “manifesto” outlined five major areas for improvement including cost saving initiatives, use of open source software, adoption of open standards, broadening community outreach via the Internet, tracking both the planning process and other relevant Town business processes, publishing Council and Town Manager emails, what is now called social networking sites for direct interaction between citizens and Town, WIFI to bridge the digital divide, public fiber infrastructure as an economic development differentiator, website accessibility, etc. It was quite a list. The Technology Board seemed a bit stunned (or maybe bored) but, even so, they did me the courtesy of listening as I outlined my plan of action. I continued working on those items when I became an official member of that board. Some of the initiatives have moved forward. Others languish. None have been completed. One issue I brought forward was on-line video of Council and other important advisory board proceedings. Because of the sketchy minutes many advisory groups kept, I also wanted audio of all board proceedings. When the Town lagged in their effort to put Council meetings on-line, I took it upon myself to upload (here) as many as possible. Finally the Town contracted with Granicus (which uses Microsoft’s proprietary technology) to do the same. Now we have video (here) which is easily accessible for those folks running Winblows. Mac and Linux users are kind of cut out (see the problem with not using open standards?). Anyway, long windup to another in a long line of re-requests. In this case, online video documenting the proceedings of our Planning Board (pretty common elsewhere, important when minutes lag Council approvals or don’t adequately capture debate). Last week the cable-customer supported People’s Channel presented their annual report. As part of that report, they expressed an interest in doing more coverage of governmental events. I’d like to follow up on Kevin’s comments last night. I’m not sure if you are aware of my several year effort to get Council to broadcast advisory meetings, but I believe this is what Kevin was referring to. In terms of priority, I have asked that the Planning Board be the first in line. As you know, the Planning Board’s decisions have significant impact on the community. Many other communities already broadcast their deliberations. Do you think TPC could assist the Town in that effort? Since you brought the issue up last night. As you know, I’ve been calling for more extensive coverage of advisory board proceedings for years. Priority one, I believe, is broadcasting and posting video of all the Planning Board sessions. This is quite common elsewhere. Planning Board’s decisions have significant impact on the community. Beyond their process, which we could do a much better job explaining, zoning issues as a whole seem somewhat opaque to the wider community. Televising their proceedings would go a long way towards involving our community at a point where their concerns can have the most impact. I hope you will put this on a fast-track with Chad and company. To date I’ve had no response from either Chad or Kevin. I’ll update folks should I hear from them on what I think would be an excellent improvement to our governance process. UNC’s Chancellor Holden Thorp takes a postion (“Carolina North: A Glass Half-Full Perspective”) on Horace-William Airport’s closure. One of the most vexing issues, though, has been the future of Horace Williams Airport. As you know, it occupies the heart of the Carolina North acreage. It’s the flattest part of the tract and, therefore, the best place to build Carolina North. So we have to close it. Now, I realize it doesn’t take a lot of analysis to figure out that closing the airport is important for the future of Carolina North. But figuring out HOW to close the airport . . . that’s another story. Ultimately, I think it comes down to this. The AHEC program is an extremely important asset to this University and to our state. Our doctors, nurses, other health professionals, and our MedAir pilots are as committed public servants as you will find. The work they do and the service they provide are fundamental to who we are as a university. And we are telling them that we have to close their airport to build Carolina North. I have analyzed all the options, and I’m convinced that we really do have to close the airport to make Carolina North all that it must be. I’m equally convinced that we should fully support the airport authority authorized by the General Assembly as the best way to pursue creation of an airport in Orange County. It gives the county zoning authority, and it turns over the siting and development to a public body with greater expertise than we have. For AHEC and MedAir, I think a move to RDU for the short-term is workable. But for the long-term, we owe it to our doctors to appoint the airport authority to see if there’s a better alternative. We have said all along that we wouldn’t close Horace Williams Airport until we had to. With today’s challenging economic climate, we anticipate that funding for initial Carolina North construction likely will be delayed. Our state appropriation for planning and infrastructure for the Law School relocation to Carolina North is frozen, at least for now. And Alexandria Real Estate Equities, Inc., our partner for the Innovation Center, has put new projects on hold, although they have affirmed their interest in our project. So, as I posted last night, the University maintains their stance that closure is contingent on Carolina North’s building projects moving forward. I am disappointed that Holden continues to maintain that the only path to serving AHEC’s needs involves a new general aviation facility. This fixation makes no sense at this point and counters UNC’s own consultant’s recommendations to move AHEC to RDU. Sure, the airport authority, with the sovereign powers the State granted it, is probably the best way to get an airport built in Orange County over local residents’ objections. Where, though, is his concern for the Authority’s other duty – to factually justify the necessity of a general aviation facility? The Authority’s duty to “support the missions of the University of North Carolina at Chapel Hill or the University of North Carolina Health Care System” has to balance against the significant local impacts, the $60-100 million price tag, the infrastructure costs shoved onto local residents. I applaud Holden’s willingness to engage the community in the discussion via his ‘blog. I wish other local officials took a lesson from him. I already left him a comment on his post. I hope folks weigh in with their thoughtful and considered input. Hat tip to Fred Black for highlighting Holden’s comments. Hey folks, thank you for reading my ‘blog. I was getting a ton of comment spam over the last six months,so I had to restrict comments to those folks who registered. The latest WordPress has additional controls that should help throttle that nonsense. I’m now relaxing CitizenWill’s commenting policy to encourage more reader involvement. To comment, simply select a name and use a legitimate email address. If you are new to CitizenWill, your first comment will require approval. After that, your comments will appear directly on the site. Tonight’s meeting (background) was well attended . Many of the folks attending were there to send the message “No Airport!”. Chapel Hill News reporter Eric Ferriri did a pretty good job covering that part of the meeting over at OrangeChat. The Chancellor was missing in action. I think that is two of three meetings now. The Council-Trustee sessions allocate two public comment periods, before and after the main meeting. Jim Ward, responding to tonight’s turnout, suggested doubling the time for public commentary from 10 to 20 minutes. I believe the 8 folks signed up had adequate time to get our points in (though I could easily spend a few hours going through the detail divergences in UNC’s proposals, ways to flesh out the development agreement, setting goals/metrics/methodologies to measure compliance, etc.). After thanking staff for producing a nearly complete agenda a few days before this meeting (unlike the few hour lead times of the last two meetings), I took a few moments to ask some questions and add some suggestions to my earlier list. These type planes are used both for charter and commercial commuter purposes. I have lived near Horace-Williams Airport for about 16 years. During the recent uproar over siting a new UNC-sponsored general aviation facility somewhere in the OC, I’ve had a few folks ask what kind of traffic to expect. There’s the early morning cacophony of AHEC cranking up their prop-driven fleet. The mid-day buzz of single engine vehicles. And, on a game night like this evening, the late-night roar of corporate jets. By the way, here’s a nice chronology of UNC’s back-tracking on their “no jets” policy. Required reading for anyone interested in possible outcomes at the proposed new facility. Two posts in two days highlighting Gerry Cohen’s Drafting Musings? Hey, quality posts deserve link love! Following on the heels of his historical survey of buffalo noses and other NC legislative curiosities is this post on how bills actually wend their way through the legislative process. Most civics classes focus on how a bill becomes a law. Just as important is how an idea becomes a bill. During the 2007-2008 legislative session, 4,993 bills and resolutions were filed, and 884 (17% of the total) became law. That wasn’t the whole iceberg, legislative staff received 5,693 bill drafting requests from members. That volume of requests has been steadily rising, from 3,401 in 2001-2002, to 3,533 in 2003-2004, up a staggering amount to 5,367 in 2005-2006 and then up to this past’s session’s total. Fascinating insight into sausage making North Carolina-style. We just got a strange burst of flurries falling from a partly cloudy, mostly blue, sky. Starting with a few big flakes, we got about 5 minutes of solid flurries that subsequently tailed off. One of the projects on tonight’s agenda was D.R. Bryan’s six story Southern Village hotel. The hotel was to be plopped down in Southern Village’s central “square”. At 75+ feet, it would tower over the nearby United Methodist Church. Local residents were concerned that this 6 story project wasn’t human-scale or compatible with the existing surround. I fully agreed. “We value the human, pedestrian-scale of our existing ‘Village’ and believe the mass and scale of a 75-foot building set diagonally from the United Methodist Church is incompatible in proportion to the neighborhood area,” the petition said. According to the Chapel Hill News OrangeChat, the project has been pulled from the agenda awaiting a supposedly more palatable 4-story variant. They have a new plan that is four stories, they announced last week. The new plan also closes Abedrdeen Drive to create a plaza connecting the hotel to the community’s village green and stage. OrangeChat also noted that one of Bryan’s partners, a Southern Village resident, opposed the project. Ben Waldorf, former Mayor Rosemary Waldorf’s son, signed the petition challenging the project. You might also remember that Rosemary recently suggested providing direct economic incentives (cash) to fill all the empty commercial properties around town. 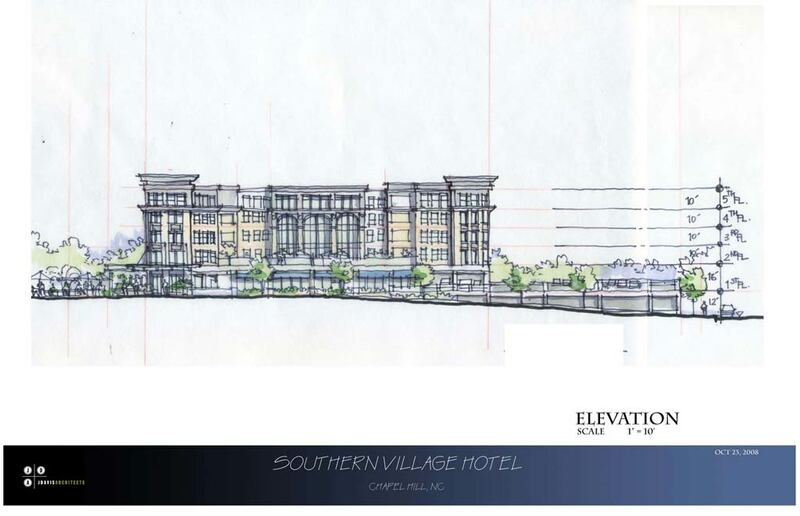 No indication as of yet if cash incentives will be required to fill this new hotel. Gerry Cohen, Director of Bill Drafting for the North Carolina General Assembly since 1981 and former Chapel Hill Council member, maintains a fantastic ‘blog Drafting Musings. While he usually covers the vagaries of NC’s legislative sausage-making, luckily for his readers he also veers into interesting back-stories of local and state events. Today he posts the presentation he gave at the annual Capitol Beat opening reception on the “buffalo nose and other tall tales”, one which involves North Carolina’s Reconstruction era 3rd House. …the Third House was located in the west side of the first floor In 1868, during Reconstruction, an office and a makeshift bar was set up in the West Hall Joint Committee Room by former Union General Milton Littlefield. Due to its regular use by many legislators and officials under General Littlefield’s dubious influence, the room became known as the “Third House” of the legislature. Do you recognize the following scene? This is East West Partner’s revisionist view of Chapel Hill as improved upon by their East 54 project. They have provided a cool animation of the eventual East 54 living experience. Their Chapel Hill doesn’t match reality. What is it about big time developers and their desire to re-conceptualize reality? From what I hear, East West Partners are working hard on their Leadership in Energy and Environmental Design for Neighborhood Development (LEED-ND) certifications. East54 could be the first North Carolina development to leap LEED-ND’s hurdles. An accomplishment well worth noting if they run the whole race. Isn’t that worth overlooking a little virtual retouching of Chapel Hill?